FREQUENTLY ASKED QUESTIONS: Everything You Want To Know About Orchids But Were Afraid To Ask! IF YOU ARE NEW TO GROWING ORCHIDS PLEASE CONSIDER PRINTING THIS REPORT, FREQUENTLY ASKED QUESTIONS. IT CONTAINS A LOT OF GOOD, GENERAL INFORMATION ABOUT GROWING AND BLOOMING ORCHIDS SUCCESSFULLY. 1) Why won’t my orchid bloom? What am I doing wrong? This is probably the question I get the most. But there is not a simple answer. First start by telling me what kind of orchid it is if you know. If it has a tag tell me exactly what it says on the tag. Tell me what your growing situation is and what light and media and watering situation you have. Then, hopefully we can move forward. I like to say that orchid growing is like real estate. It is all about location, location, location. Essentially orchids need to be in an area that resembles the micro-climate where they are from for them to thrive. And the components of successful growing and re-blooming orchids are multi-factorial. It depends on the kind of orchid, the amount of light, water, temperature that the individual orchid needs to thrive. And then sometimes on subtler components like how much fertilizer, when, does it need to be continually moist, does it need to dry out between watering, does it need a rest period. As Henry Jaworski says in Orchids Simplified “While other plants provide a pleasant background to my life, orchids have burrowed into its center”. Don’t be afraid. Orchids are a lot of fun! 2)	I am a good gardener. I can grow houseplants just fine why can't I grow orchids? I have a friend who is an orchid grower who says “An orchid expert is someone that has killed a thousand orchids.” This is of course an exaggeration. But as I said before the growing of orchids is multi-factorial. There are many components that contribute to the thriving of an orchid. And there are many kinds of orchids with very different cultural needs. This is part of what makes orchids so fascinating and so rewarding. So the first thing to do is to determine what kind of an environment you can provide for the orchids. And then choose the orchids that will do best in the environment that you can provide. Of course that does not help with the orchid that was just so amazing that you just HAD to have it. Or with the one that you were given as a present. But if you are acquiring them yourself it is best to stick to what will work in your particular situation. Try to duplicate the conditions where the orchid grows in the wild. Check the literature on the kind of orchids that you want to grow, or that you know you have. Find out what the cultural requirements are for these lovely creatures. Factors that are generally important are 1) Increased humidity above “normal” indoor humidity (usually 40-70%. 2) Correct light. 3) Correct daytime and nighttime temperatures. 4) An appropriate watering regime for the kind of orchid. Often the need for a pure water source. 5) Good fresh air circulation. 6) The use of weak (dilute) fertilizer from time to time. 7) An appropriate potting medium and pot (container) or mount for the orchid to grow on. 8) Re-potting or changing the media as it decomposes or as the plant outgrows it. To help answer many frequently asked questions: Let’s look at these factors in more depth. There are different ways to do this depending on your growing situation. You want the humidity around the orchid plant to be between 40%-70%. In general you want the humidity (along with the temperature) to be lower at night). In the home one of the easiest ways is to fill trays or saucers with gravel or pebbles and put water in them. Put the plant ABOVE NOT IN the water. Make sure to use a non porous container like a plate or saucer if you are putting your plants on a wooden surface or a surface that will be damaged by moisture. Humidi-Trays are an excellent tool to do this. These are plastic trays with a plastic fitted grate (they come in various sizes). They can be set on a window sill or table top. The plants sit above the water that is held in the tray below. The trays hold the water, the grates hold the plants and the evaporation of the water increases the humidity around the plant. Other ways of increasing humity around the plants is by using hand sprayers of various designs (handheld or larger compressed sprayers) and periodically mist the plants with water. Let me caution you to be careful if you go this route as standing water on plants for long can cause problems. If I do this I always do it before noon. Of course good air circulation helps with this. It is possible if the light is right to grow plants in the bathroom where the humidity is higher than the rest of the house. Or you can put them in the shower from time to time. NO HOT WATER directly on the plants, however. You can use a humidifier in your house positioned close to your orchids. If you are growing in an outdoors or in a greenhouse you can use a misting system that is either controlled by a timer or by a humidistat. Light requirements are another set of frequently asked questions. In an overall sense most orchids like it somewhat bright. Many orchids are ephiphytes growing in trees above the forest floor. How much they need is completely species dependent. And it varies widely. Phalaenopsis (Phals.) and Paphiopedilum like it about 70-90% shade. For Vandas most Dendrobiums and some others you will need very bright conditions from 30 % shade up to full sun. For Catteyas and Oncidiums from 50-70% shade. One way is to check your available light with some confidence is to quantify it by using a light meter to see what will grow best in your situation. Light is measured in foot-candles. There are a number of resources that specify what the foot candle requirements of certain orchids are. The American Orchid Society (AOS) website is one of these resources. Like with many of the frequently asked questions with respect to orchids there is no ideal media for all orchids. Depending on the kind of orchid that you are growing and your individual situation each has its own advantages and disadvantages. Often you will get an orchid in a particular media so you can start with that. Although sometimes orchid growers “dress up” an orchid to make it appear more appealing for sales when in fact the orchid would prefer to grow in or on a different media in order to thrive. In the long term it can really be best to experiment and see what works right for you and your new orchid friend. And reading in the literature is good too. Personally I mostly work with a fir bark (of various sizes), charcoal, large perlite and red lava rock because it suits what I grow and how I water and my conditions best. However cork bark, coconut chunks or even sticks can work very well. Cork bark and sticks are called mounts and mimic how some orchids grow on trees in the wild. I do grow and re-bloom orchids on mounts and sticks quite successfully. Again it depends on the orchid and its particular cultural needs. And it is good to be aware that different media will need different watering regimes (see # 6). BS means blooming size or FS means flowering size. Blooming size is an indication that the the plant is of a size or age where it will bloom within a year in the appropriate season for that orchid. It may not necessarily be the mature adult size of the plants but they are large enough to flower. NBS or Near Blooming Size indicates that plant is one or two years from blooming given the proper culture. I recommend that newer orchid hobbyists buy HEALTHY plants that are in spike or just about to bloom. Look at the roots. And the pseudobulbs if they have them. Healthy roots, usually means a healthy plant. This gives the possibility of enjoying your new friend in all its flowering glory and some time to learn about the cultural requirements of that particular orchid. With some orchids the flowering time is quite long and by the time it has finished flowering, one now knows more how to take care of it and keep it healthy. Jump in! Just do it. Everybody learns a little differently and I think it is best to take a broad approach. 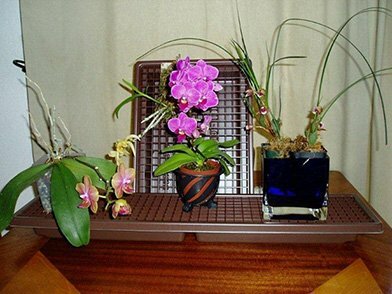 Acquire an orchid, and if you are new to orchids try to get what is considered an “easy” orchid. One that is not too fussy and is relatively easy to rebloom. Take advantage of the resources available to you. Read books, either hard cover or eBooks. Check your library for orchid books. Go to an orchid show, they are held all over the world. Consider joining an orchid society near your home. Consider subscribing to the magazine of your country’s orchid society if they have one. Here in the USA the American Orchid Society has a large membership and a magazine that is devoted to orchids and orchid growing. In addition there are several online forums that are available to continue to enhance your orchid growing education and experience. Just keep going. It is worth the journey. LIKE WHAT YOU SEE HERE IN THE FREQUENTLY ASKED QUESTIONS? IS THIS INFORMATION USEFUL FOR YOU AND YOUR ORCHID GROWING JOURNEY? SIGN UP FOR OUR FREE MONTHLY NEWSLETTER, ORCHIDACEAE. We promise we will never rent, sell or otherwise misuse your email address. Sign up now to get helpful orchid growing tips and information.